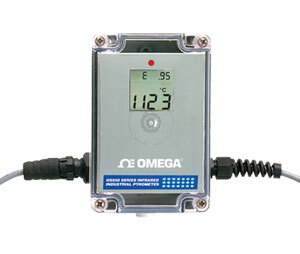 The OMEGA OS555A Series industrial high performance thermometer/transmitters offer a high temperature range of 538 to 2482ºC (1000 to 4500ºF), 110 to 1 optical field of view, any voltage or current analog output to feed directly to panel meters, recorders, temperature/ process controllers, data loggers, and data acquisition systems. It also offers adjustable Emissivity, high and low alarm outputs, PC serial interface, temperature data logging in real-time, and fast response time of 100 msec. These ruggedly designed units are ideal for high temperature measurement and see through glass window applications. PLEASE REVIEW PRODUCT SPEC SHEET FOR COMPLETE PRODUCT SPECIFICATIONS. Note: Sensor head cable can be extended at the factory at time of purchase to a maximum of 15 m (50'). Add suffix "-(*)FT" to order number and $1.00 per 0.3 m (1') over 5 m (15') to price.